Having passed level 2 the emphasis of training will now move away from heelwork, sit stays and recalls. You should have this cast in stone. Retrieving ~ you have mastered the simple seen retrieve from a short distance. We will now be aiming towards longer distances, with memory and split retrieves with steadiness. You should also know the commands we use and why we use them. 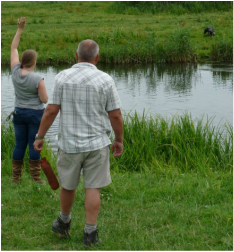 Once your dog is retrieving to hand you will need to start varying the types of retrieve you do, there is no point in carrying on doing seen retrieves across clear ground. Start by making the area harder, cover, bushes, across ditches and jumps etc, this will encourage your dog to use his nose to find it. Walk you dog to heel about 25 meters from start point, sit the dog hold the dummy and drop it a few feet from the dog and tell him "Mark", - walk back to where you started with the dog sit him down tell him FETCH when he reaches the dummy give the command HI LOST/THERE/SEARCH and when the dog picks the dummy give the recall command. Hand Signals ~ you have worked on the real basics the recall and the sit, we will now start introducing directional hand signals, left, right, back and on at a distance. The easiest way to start these are by sitting the dog facing you about 10 paces away, you throw a dummy to his left and to his right, then make an exaggerated signal to the first dummy you threw giving the command OUT, the dog should go and get this dummy and bring it back to you, you then take him back to where he started and repeat the exercise for the second dummy, once he has mastered this you can introduce a third dummy behind him and give him the ON command for this dummy, some people introduce a further command BACK. REMEMBER ~ You can also introduce hand signals in your daily routines for example when you are asking the dog to enter cover out on a walk, or even at home. The Split ~ two dummies in different places. The easiest way to do this is by having another person with you standing opposite you about 25 meters away. Sit the dog facing this person, who will then throw one dummy to their left and one to the right as far apart as possible, this will give you chance to stop the dog going for the wrong dummy. It is suggested that you send the dog for the first dummy thrown, when he has retrieved this you can sit him down, set him up again and send him for the second dummy. Once he has mastered this you can do one of the retrieves as a memory and one as a seen (this can also be classed as a distraction). You walk the dog out to a point about 25 meters away, drop the dummy as you would with a normal memory retrieve, then take the dog back to the point where you started, sit the dog down and throw another dummy in the opposite direction to where you done the memory, you now turn the dog around and send him for the memory, remember to be ready to stop him going for second dummy (which is a distraction from the first dummy). Water ~ The dog should be entering water with confidence. He should enter water willingly. Encourage him to swim greater distances. NEVER attempt to throw or push him in, this can put him off for life. Once he is going in and out of the water retrieving the dummy you can start introducing steadiness. Expect him to sit and wait on the bank for the retrieving commands (mark, on and fetch, hi lost etc). STOP ~ probably the most important command you can teach your dog and a must before you can introduce him to ground with game on. Your dog will by now understand the SIT command whether verbally or whistle. Start by sitting the dog next to you, leave him and walk about 20 meters from him, stand and recall him when he is half way to you blow the stop whistle and raise your hand (reinforce verbally if necessary) Practice this exercise frequently when he is a little distance away but always close enough so that you are able to insist that he stop where you wanted. Then he will learn that HE MUST STOP INSTANTLY when commanded. Once he has mastered this exercise start increasing the distance. Make sure you sometimes make it a proper recall otherwise the dog will start anticipating what you are asking him to do and become slow. When he is doing this reliably you can start introducing temptation like sending him for a retrieve stopping him and then sending him on.